The moment she learned the horrible truth about her life on Australia, the derelict ship overrun with violent gangs, Chan Aitch made it her mission to save everyone she could from their fate worse than death. But her efforts were in vain. Now, everyone she cares about is dead or in prison, and Chan is more alone than ever before. As the only person to have escaped Australia's terrible crash-landing back to Earth, Chan is now living in poverty on the fringes of a huge city. She believes Mae, the little girl she once rescued on the Australia, is still alive—but she has no idea where Mae is, or how to find her. Everything on Earth is strange and new, and Chan has never felt more lost. But she'll do whatever it takes to find Mae, even if it means going to prison herself. She's broken out of prison before. How hard could it be to do it again? Having horrified and amazed readers in equal measure across the first two volumes of The Anomaly Quartet, and doubled down on darkly character-focused dystopia in The Testament, The Machine and latterly No Harm Can Come to a Good Man, James P. Smythe has gone from strength to strength since his underrated debut in 2010. In so doing, he's demonstrated that he's not just a jack but a master of all the trades he's tried—a mastery that, on the back of last year's Way Down Dark, evidently extends to the young adult market. Book the first of The Australia Trilogy read, as I said, "like a lesson in how to bring your fiction to a more sensitive sector without sacrificing the parts that made it remarkable." It didn't talk down to its audience. It didn't diminish the darker parts of its narrative. It didn't hold back in any measurable sense. To discuss Long Dark Dusk, nor can I. I have to hit on what happened in the last act of Way Down Dark. I have to tell the truth, the whole truth, and nothing but the truth about the Australia. The thousand-some souls aboard the Australia believed it to be a generation ship blazing a trail through space in search of a world where humanity, having bled Earth dead, might put down renewed roots. They were wrong. In actual fact, the Australia was a prison ship in stationary orbit around the very planet its inhabitants thought they'd left so long ago; a planet, ravaged but not ruined by environmental catastrophe, whose people, roughly a hundred years hence, see that positively apocalyptic period as little more than a bump in the road. As an embarrassment, even. I was meant to step off the ship, having saved the lives of the people I cared about, the good people who did nothing wrong, who didn't deserve the fate—the curse—that had been put upon them. I was meant to look back at everything I had lost—my mother; my childhood; even Agatha, so recently departed—and still see something resembling the future I had dreamt of. Mae would be there and we would be a family. Family is what you make it; that's something I learned. It's not blood. It runs deeper than that, and stronger. That's how it was meant to go. Instead, Chan's compatriots were captured by government agents unwilling to let word of the Australia's dismaying fate get out—agents Chan herself only barely escaped. Ever since, she's been living in the impoverished docks of D.C., doing dirty jobs for a crazy lady called Alala in order to curry enough favour to trade for information about Mae's whereabouts. When I imagined leaving the ship, I imagined a total change, a life that I wouldn't recognise. That was when everything was still a promise, a hope, a dream—when knowing that the new life, the better life we were looking for might come to pass. And then we found it; the new world, same as the old world, and in so many ways. There are walls around me that I cannot climb; towers, hundreds of storeys high, that overwhelm me. That doesn't mean it's going to be easy. Indeed, anyone with an awareness of the stark and often shocking tales Smythe has told in his time will know it won't be. There will be betrayals, and blood... and exploding bodies; compromises will be made... some of which are apt to cast doubt on the very integrity of Chan's character; a character whose actions will of course have consequences... consequences that could cost her the little freedom she's found since escaping the Australia. Luckily, there's a little—just a little—more light in Long Dark Dusk than there was in Way Down Dark. Amongst the automatons of Smythe's semi-devastated D.C., there are a few seemingly decent people. A couple of familiar faces are Chan's saving grace in the text's second section, one of whom rides the road to redemption to excellent effect. And there are, in the interim, occasional opportunities for Chan and the remains of her clan to have something like fun; one standout sequence is pleasantly reminiscent of the best moments from Mad Max: Fury Road. Smythe also allots more time to developing Chan as a character in book two of this trilogy. Whereas in Way Down Dark she took a backseat to job lots of plot, she's his foremost focus here: this is her story as opposed to the Australia's—and it's a better one to boot, by and large because she has a depth she was lacking last time. Haunted by all that her earlier choices have wrought, she agonises over the difficult decisions she's given in Long Dark Dusk like a real human being. That she he doesn't dither when the decision-making is done shows she's as strong a heroine as ever—she's just not as sure of herself as she once was, which makes the moral quandaries she has to overcome that much more emotive. 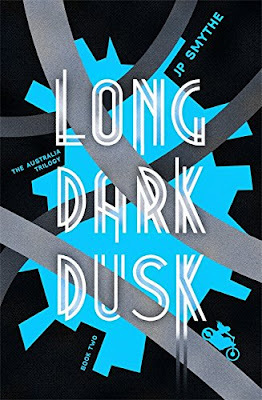 Long Dark Dusk a little slow to get going, I grant, and its slightly wider world never quite comes to life in the same way as the many layers of the Australia, but in every other respect it plays to Smythe's strengths as a purveyor of powerful characters, engrossing prose, surprising narratives and sudden sucker punches to the gut. Long Dark Dusk has all of that and then some in a tidy little package that should appeal to the same cross-section of readers who were gripped by its impressive predecessor.